Traveling through all ages has been a movement towards the new and receiving bright impressions. Only earlier for this it took days, and even years to overcome dangerous kilometers. Now everything has become much more accessible, so independent travelers who want to visit Jerusalem, Haifa, Tel Aviv and other legendary places in Israel, increasingly prefer to rent a car and feel free. Driving a car in Israel will bring you many new experiences. You will be surprised by lifeless mountains and flowering gardens, olive groves and history at every step of the way. Excellent road conditions, magnificent architecture of cities and a variety of natural landscapes, all this - only a small part of this amazing country. A trip to Israel promises vivid impressions and an unforgettable vacation. In order to pleasant impressions are not overshadowed by the inability to visit all the planned places, you should pay attention to such a service as car rental in Israel. The overall picture of the world would not be complete without the history of Israel. As the legends say, visiting this country, you can find something new for the spirit and for the mind. And renting a car in our company will help you touch many wonders and mysteries. Traveling through Israel begins with a route planning and all related nuances. The best way to plunge into the extraordinary atmosphere of a unique country and to visit all the famous places that were only dreams before was to rent a car. Spontaneous trips on vacation have a special connotation: as a rule, emotions from them are especially strong, and impressions are brighter. If, walking through the Old City in Jerusalem, you decide to drastically change the situation, then the best way to do this is to rent a car. Traveling around Israel would be incomplete without a trip to Haifa. This city is contrasted with its districts, and the mild climate, the sea and historical monuments allow an inquisitive tourist to spend time here pleasantly and profitably. What is interesting in this city? The old city of Jerusalem is one of the oldest in the world. A huge number of legends and historical facts attract tourists and pilgrims from all over the world. The official representative of Europcar Holyland Cars offers to visit the legendary places in comfort. Dreaming about a trip to Israel, you should definitely include in the program visiting the city of Eilat, which is located on the shores of the Red Sea. After leaving the plane, you can immediately rent a car - car rental in Israel is provided on favorable terms by HolylandCars. Among the wonders of Israel, there is a special landmark, the size of which is about 60% of the country. We are talking about the Negev desert, where at one time many trade routes took off, and today cities are located. Renting a car in Israel makes it possible to take a closer look at the mysteries of this area. While in Israel, ask yourself: "What kind of sea do I want to see tomorrow?" Indeed, besides studying historical buildings and valleys, nature itself is conceived in such a way that one of the country's ancient and vibrant landmarks is its seas. Rent a car in Israel is a great opportunity to meet with each of the four seas. The north of Israel attracts tourists with its plateau, valleys and settlements that have been mentioned in history. Here is located the only city in the country, where the output falls on Sunday. Rent a car in Israel, provided by Holyland Cars, will open the way to the holy Christian city of Nazareth. Renting a car in Israel is an opportunity to follow the paths of historical events, discover new and unusual things, enjoy a good rest. One of the highlights of the trip will be a trip to the west bank of the Jordan River, where the city of Hebron is located - another shrine for the Israelis and one of the oldest settlements in the world. Renting a car in Israel opens up rich possibilities not only for excursions to memorable places in an amazing country, but also creates a unique atmosphere of easy travel and relaxed rest. Bright and diverse views of Israel and a huge selection of ways to spend time make every day unique. Traveling is one of the most enjoyable opportunities for holidaymakers and car hire in Israel with Holyland Cars is the best choice for trips that reveal rare species and legendary terrain. Those who love the sea and music and who dream of relaxing with the fireworks of impressions should definitely visit Ashdod. Not far from Haifa, a little to the north, the city is located, which according to historians had a significant impact on the fate of Israel. No wonder: for 4000 years of continuous existence of this settlement, its inhabitants have always been in the thick of things: the city of Acre was ruled by the Phoenicians, was conquered by Alexander the Great, was in the Roman Empire and became the scene of many events during the crusades. Renting a car in Israel will help you make a fascinating journey through ancient sites that have become a modern center of tourism. As you know, the Sabbath is a day off in Israel. This feature of the country can be a reason for making an interesting turn in the plans and rent a car in Israel will help to carry it out. If you have just visited the excursions in Jerusalem and Tel Aviv and plan to continue to rest on the sea coast, then your route can be planned in the direction of the south-western part of the country. A trip to Ashkelon - a city with a 12-kilometer tourist area along the Mediterranean coast - is another opportunity offered by car rental in Israel. Rare emotions can be compared in strength and diversity with vivid impressions of travel. If your trip to Haifa was fascinating, but you want to continue your journey, then Zichron Yaakov will be an excellent turn in the trip. Visiting the resorts of Israel is often one of the priorities for tourists, because healing and caring for themselves are among the most important rituals of modern man. Renting a car in Israel is a fascinating trip to colorful cities and well-groomed beaches, it is a visual study of ancient history, and, of course, the opportunity to visit the best resorts of the Dead Sea, one of which is Ein Gedi. Car rental in Israel is the best way to feel the atmosphere of travel among picturesque landscapes and ancient cities. For the tourist, keen on exploring the sites of the excavations, surrounded by legends, a trip to Beit Shean will surely give new food for imagination and inspiration. Rent a car in Israel in this case will be a kind of bridge, paving the way for the curious traveler to historical places. Nahariya - one of the leading resorts in the north of Israel and the city where you can both relax and get acquainted with local attractions. The official representative of Europcar Holyland Cars is car rental in Israel, allowing you to forget about the inconvenience on the road, so the path through the northern plains of the Nahariya neighborhoods will leave the most pleasant impressions. Traveling in Israel is not only getting to know the wonderful views and relaxing by the sea, but also buying souvenirs. The desire to please loved ones with gifts or to take with them a reminder of the time perfectly spent appears to every tourist, especially when it comes to such a bright and unusual country. Renting a car in Israel will help you quickly and successfully navigate the shopping map. The suburbs of Tel Aviv attract tourists no less than the famous city itself, because every settlement near the Mediterranean coast can give a plot for vivid memories. Rent a car in Israel will open Holon, which is informally called the "children's capital", where each family member will find something unusual and interesting. One of the most striking sights in the south of Israel is the Masada fortress, which is unique not only for its history, but also for its magnificent location. The path here can be paved through Arad - the nearest city, near which is the Dead Sea. Rent a car in Israel is an extraordinary taste of travel and an opportunity to forget about distances. Israel can give the traveler a lot of pleasant memories of amazing architecture and nature, as well as the opportunity to buy unique souvenirs and jewelry. The official representative of Europcar Holyland Cars offers low prices and seasonal discounts on car rental in Israel, which makes the rest more comfortable and brighter. Therefore, being near Eilat, you should definitely visit the Dolphin Reef. Meeting with the sights, which provides car rental in Israel, every day opens a new understanding of the features of this country. Once in the western areas, travelers should visit the ancient city of Caesarea, where the beach, theater and amphitheater will not leave indifferent. The National Biblical Reserve High Bar Yotvata occupies the southern section of the Negev desert. Picturesque nature and unique animals evoke joyful feelings, and renting a car in Israel from Holyland Cars is the best way to get here. Often travelers choose Jerusalem as their starting point, and then decide where to go next. This method of transportation is most convenient to carry out by car, so renting a car in Israel is the best choice for holidaymakers. Choosing a model to taste and feeling a surge of strength from the first-class service of Holyland Cars, in which excellent cars come together, low prices and seasonal discounts, travelers dive into the world of vivid impressions that are generous to the roads and the city of Israel. The nature of Israel is rich and diverse, and the views of the seas, clean sand, fancy rocks and green hills are able to charm any traveler. No tour will give such an opportunity to enjoy the wonderful views, like renting a car in Israel. The feeling of unity with nature and the real pleasure of the trip - all this and much more is given to its customers by the official representative of Europcar Holyland Cars. What if the dream of exploring the western part of Israel contradicts a limited amount of time? The correct answer to this question is car rental in Israel. The official representative of Europcar Holyland Cars offers the best cars with which your journey will become a dream come true. The rich history of Israel offers travelers so many discoveries that their study will take more than one year. The official representative of Europcar makes it possible to get acquainted with the sights for the period set aside for tourists to travel around the country. Rent a car in Israel is a vacation full of acquaintances with history and various nations, which bring additional color to relations with an already unusual country. Old houses, picturesque courtyards and close proximity to the Lebanese border make the trip to Metulu (the northernmost settlement of Israel) exciting and memorable. This small town will be interesting even to those tourists who have already been in these parts. We offer you to drive along an exciting route, which ends with a walk to the Source and the picturesque park, which is located nearby. Highway 98 - Israel’s eastern road. Previously, this road was open only for heavy military equipment and only 30 years later it became possible to travel on it in a private or rented car. In the northwest of Lake Kinneret, Jesus began a three year mission, laying the foundation of Christianity. Here Jesus delivered his first sermons, here he performed his miracles, and here he gathered his first disciples, who later became his apostles all over the world. Today, in quiet gardens, along the shores of the Sea of ​​Galilee, are open to the church of amazing beauty, dedicated to the events that occurred in these places two thousand years ago. Car rental is a very common area in Israel. Nevertheless, for people who observe the Sabbath, there is a problem: if the rental dates fall on a Saturday (Shabbat), then you have to pay for this day and at the same time do not get behind the wheel. In fact, a person must pay for one “empty” day of rent. Fortunately, in Israel there are companies that rent a car and do not charge for Saturday. Every driver, even if he has been driving for more than thirty years, most likely remembers the day he passed the law exams. On the one hand, this is a new exciting stage of life. Mature and independent. On the other hand, being a driver is a big responsibility. Responsibility for both himself and those who travel with him in the car, and for other road users. Our company often faces the fact that tourists traveling in a group or a family of 7-9 people want to rent one big car. Very often the questions are asked: “Are we enough 7 seats and luggage?”, “What should we do if there are more than 9 of us? What kind of car will fit?”. Let's try to figure it out together. Do you plan to fly to Israel and immediately rent a car without leaving the airport? Conania HolylandCars-Europcar is conveniently located next to the arrival hall, on the 1st floor. We welcome you 24 hours a day, 7 days a week. In Israel, there are 3 types of toll roads: "Route number 6", "Tuneli Karmiel" and a dedicated lane at the entrance to Tel Aviv. Consider them all in order in our article. International rental companies or local low cost airlines - what to choose? Why are international car rental companies more expensive than many local distributors? ”What is the difference? Let's finally try to figure it out. Do I need international rights to rent a car? What is important to do when getting a car? • HolylandCars is the official representative of Europcar Israel. 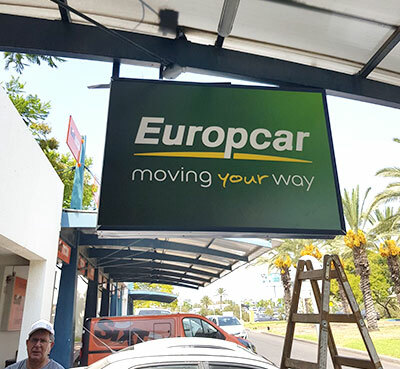 The company's stand is located on the first floor of Ben Gurion Airport, where all the car rental companies are located, under the green signboard "Europcar". You can view the map . The rest of the branches . • To sign a contract, you will need a valid driver's license, passport and personal credit card. • When you receive a car, I advise you to examine it very carefully inside and out, and also check for a triangle, spare wheel, key and jack. • Be sure to check that you have a valid data sheet and insurance policy. • Record all scratches and bumps on the receiving form, if any, this type of form is filled in with a rental company representative. • Check the fuel level and mileage, if the fuel tank is not full - indicate this in the receipt form. In this case, you have the full right to return the car with the same level of the gas tank. You can also ask to refuel a car to a full tank in order to avoid disputable situations on return. • It is very important to find out the type of fuel (gasoline or diesel). Usually in Israel, if the car is diesel, then opening the gas tank door in it, there will be a DIESEL sticker. • The local population of drivers is rather temperamental and impatient, so to avoid accidents, give in and follow the rules of the road. • All passengers, without exception, must wear seat belts. • A child seat or booster should always be used for children under 8 years of age or depending on the height of the child. The fine for riding with a child without a child seat is very high. • The maximum permitted speed of driving in the city is 50-60 km / h, on intercity roads - 90-100 km / h, on high-speed roads - 100 km / h, and in some sections of the route you can also find 110 km / h.
• Some rules may differ from those you are used to in your country. Pay attention to traffic signs, they are installed in the right places to facilitate understanding. • Israeli police do not take bribes. If you offer a bribe to a police officer, they can arrest you on the spot and issue a large fine. At the same time, the Israeli police are quite loyal to tourists, therefore, if you behave calmly, smile and be friendly, you will most likely be released on the spot. This is the case if you have committed a minor traffic accident that did not result in loss of life or damage to property. • If you still received a fine from a police officer, you must pay it immediately. The unpaid fine after 3 months begins to accumulate interest, all this is recorded in the computer and the next time you visit Israel a tourist will impose a penalty with interest on the latter. • 3) Driving a vehicle under the influence of alcohol is a very serious offense in Israel. We want to remind that often in the places where entertainment centers, clubs, restaurants are concentrated, the Israeli police expose cardons and check every driver. According to the latest laws, it is completely forbidden to drink alcohol while driving, even beer or light wine. • If a crash involving a tourist driver still led to a trial (fatal accident, for example), you need to go to court. You can not hide, because crash data is immediately entered into a computer data base and can be stopped at the border at the airport or at any land border. In big cities such as Tel Aviv or Jerusalem, parking is very difficult to find, especially free. The cost of parking can vary from 5 to 20 dollars per day. If you park in the hourly pay zone, then the payment is made in coins in the machine. - Border red with white - Parking is prohibited. - Border red with yellow - bus stop, disembarking or disembarking / disembarking of a passenger is allowed. - Blue with white - Parking is for a fee (usually there should be an automatic one nearby. To purchase a parking ticket that must be placed under the windshield so that it can be seen from the outside). Often the conditions of parking in this area varies depending on the city. In some cities in the evening after 19:00 pm this zone becomes free, but these are subtleties that need to be read on signposts. - The border is not painted (gray) - parking is allowed (if there is no sign prohibiting parking). - Wheelchair parking in Israel is indicated by a blue square with a white wheelchair on asphalt. In the event of a violation, your vehicle will be evacuated immediately and you will receive a very high fine.